And we're back to Friday Eve. I hope all of you are as excited about the weekend as I am. Yesterday, I got 6 new sets of dice from Kraken Dice, and I can't wait to try them out. We've got the next session of our D&D campaign, so that should be fun. But before we get there, we need to finish out the week. So let's do that with our Terrain Corner. 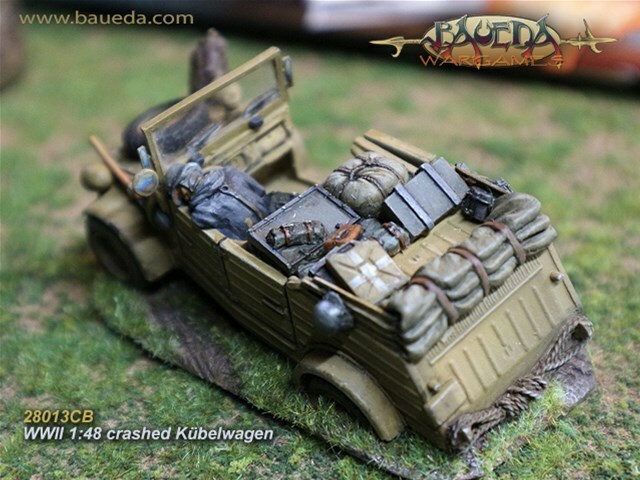 Today we have: Baueda: new 1:48 crashed Kubelwagen Available, Heroic Maps Halloween Sale Happening Now, and Loke BattleMats Autumn Ruins Encounter Mat Now Available. Code: 28013CB 1:48 crashed Kübelwagen (approximately 120mm long and 30mm high) The Volkswagen Kübelwagen was a light military vehicle designed by Ferdinand Porsche for use by the German military (both Wehrmacht and Waffen-SS. Based heavily on the Volkswagen Beetle, it was prototyped as the Type 62, but eventually became known internally as the Type 82. Body is cast in tough polyurethane in a single piece plus a separate sprue of details, this great looking model has plenty of beautifully sculpted and deeply carved surface detail to help you in painting! Supplied unpainted. Halloween is a great time for GMs and players - spooky stories, ghosts, creepy old houses. 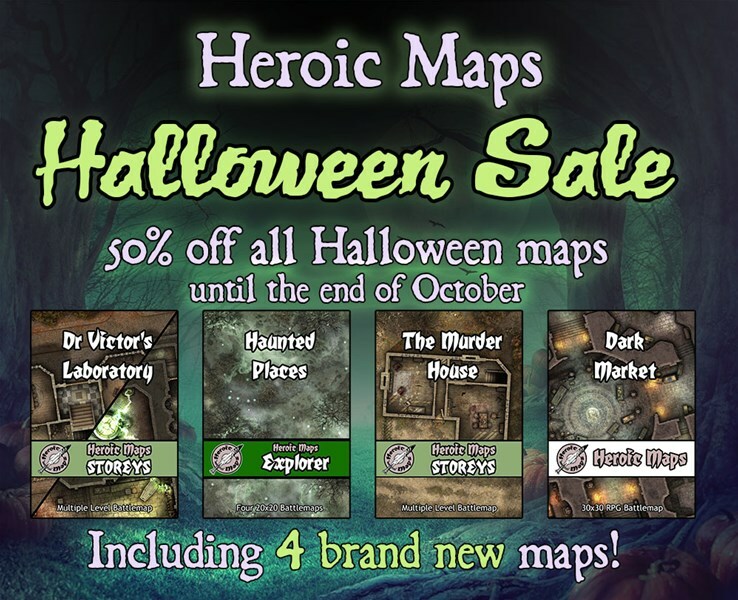 To make sure your game is stocked ready for Halloween, or to give you some inspiration, we've taken 50% off everything in our Halloween range, including 4 brand new maps. We've got Dr Victor's Laboratory, a set of four Haunted Places, The Murder House and a Dark Market! Add a Today we wanted to present one of our favourite RPG encounter mat designs - Autumn ruins. A beautiful palette of Autumn colours, interspersed with the ruins of the people who came here before will add an edge to any RPG encounter. Loke BattleMats RPG Encounter mats are – • Available in 3 sizes • Available with a range of grid and hex size options • Printed on hard wearing PVC Vinyl • Wipe Clean* • Available designs span fantasy, Sci Fi and Modern Day Themes • Over 110 designs in our range *Mats are wipe clean when using a Non Permanent Wet Marker, mats are supplied with full instructions for use. In recent years the use of miniatures in RPG has dramatically increased, and as enthusiastic RPGers Loke Battlemats wanted to add a little adventure to these occasions. 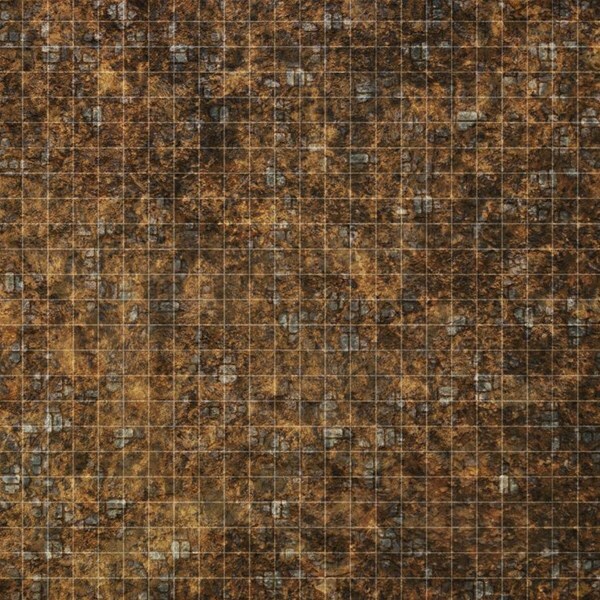 Loke Battlemats’ Range of RPG encounter mats are available in 2x2, 2x3 and 2x4 foot and are designed for tabletop RPG. Printed on PVC Vinyl the mats are wipe clean when using a non permanent wet marker so notes and diagrams can be added. The core range of fantasy based mats have a grid option for ease of use and to help the Dungeon Master plan and execute those critical game moments.